Candy car seeks for money in this small town and every badge helps it to reach the goal of the level. However, police car won't let you just collect everything you see, so you have to dodge them or shield the car! 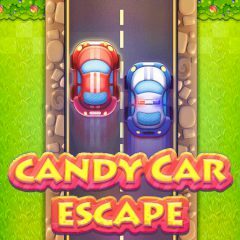 Drive candy car and get enough money badges before you run out of time. The police will chase you, but you have some secret tools that will surprise them. Collect shield badges to make your car invulnerable for police cars and get the bomb badge to blow them all. Make everything quickly and seek for money badges!